A visit to Rome's most beautiful burial ground, The Protestant Cemetery of Rome also known as The Non-Catholic Cemetery for Foreigners. I know, You're wondering why on earth we were at a cemetery on a walking tour through markets and traditional eateries? The answer is, this isn't your everyday food tour. It's a culinary journey through Rome's culture and history. Kenny, our guide had many a story to share about the area and it's past and our stop at the cemetery was on of the many highlights of the day. The Non Catholic Cemetery for Foreigners claims to have the highest density of famous and important graves anywhere in the world. While I would argue that there are many cemeteries that rivals Rome's claim to fame, I cannot deny that it was impressive. It's most famous resident is the poet Keats. His tragic story comes to a bitter end here, at this serene resting place. Suffering from tuberculosis, his doctors told him to go to Rome to take advantage of the Mediterranean climate. Sadly, he only lasted for 4 months before succumbing to his disease. Regrettably, Keats was never acknowledged as a great poet during his short life. Neither the critics nor the public embraced his prose. It tormented him to be dying at the young age of 25 before he had the chance to be recognized by the world resulting in his final wish to have his name omitted from the gravestone. What is interesting is he is buried alongside a man who died some 50 years later. Other's state that he was a name dropper, who even in death needed to be associated with fame. 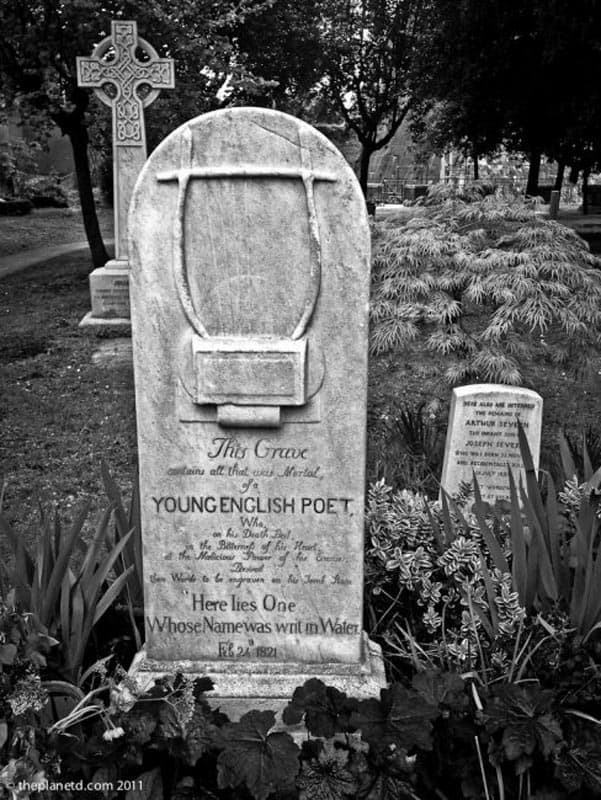 When you look closely at the grave of his own son just behind the Keats and Severn graves, you can draw your own conclusions. He seems like a bit of a name dropper to me. 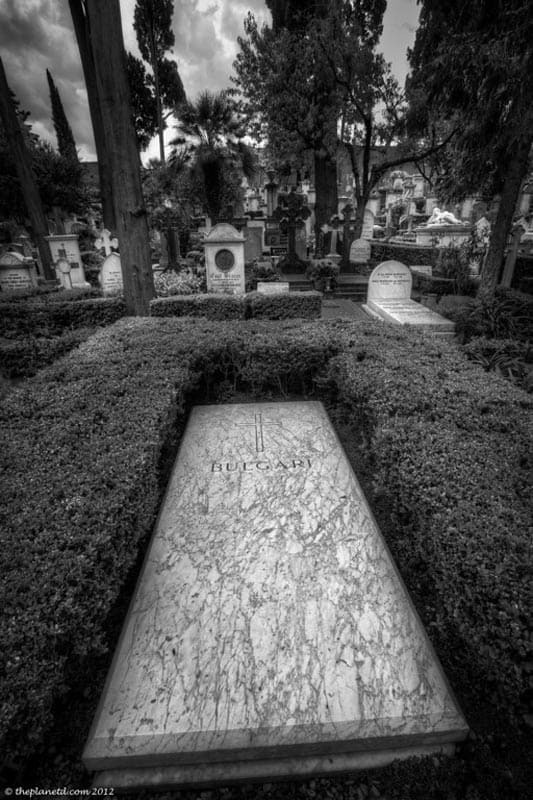 After all, Keats didn't want his name written on his tombstone, we wanted to float away into obscurity and here his friend Joseph Severn buried himself right beside Keats and put his name on his own tomb! Keats isn't the only famous poet in Rome's Protestant Cemetery. 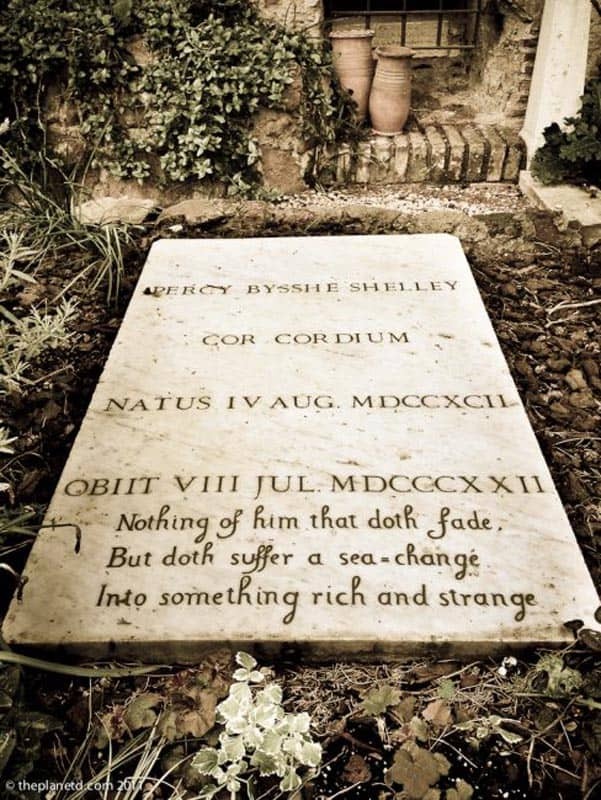 The poet Shelley is also buried among these grounds. Percy Bysshe Shelley (Husband of Mary Shelley of Frankenstein fame) wasn't suffering from a disease but still died at the young age of 29. A man living life on the edge, he sailed out to sea, even after everyone warned him of a coming storm. “Don't go out to sea” they said, “you'll die.” He didn't listen and sure enough, he died. One of the most striking tombs in the cemetery dates back to 12 BC. At 36 metres high, it is definitely an unexpected site. Caius Cestius, a magistrate of ancient Rome had the tomb built for himself when everything Egyptian was fashionable in Rome. Our guide Kenny told us that Cestius was against slavery – and yet he used slaves for the 330 days it took to build his tomb. He also said that after Cestius' death, it was discovered that he wasn't as rich as he appeared to be and the estate didn't have the money to cover the construction of the pyramid. Instead of placing his body within the tomb, they threw it into the Tiber River. There are many famous and important tombs in the cemetery and it is a wonderful stroll through Rome's colourful past, but it is also a beautiful escape from the chaos of Rome. This little oasis in the Testaccio part of town is not to be missed. Especially if you get to do it on a walking food tour with Kenny. His energy is contagious and you'll love listening to him tell a good yarn. Hint – One of his stories involves The Mafia, the Vatican, a shootout on a scooter and gelato all rolled into one intriguing mystery! You'll have to take the tour to find out what happens. 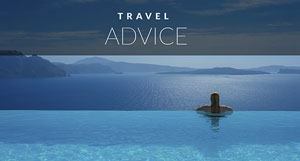 To book with Kenny, Visit his website at Eating Italy Food Tours, voted #4 in best Tours in Rome on Trip Advisor. 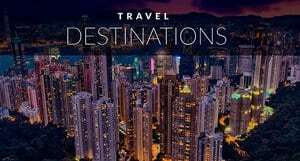 We Book City Tours Through Get Your Guide – A Good Tour Company offering last minute tours and easy cancellation. 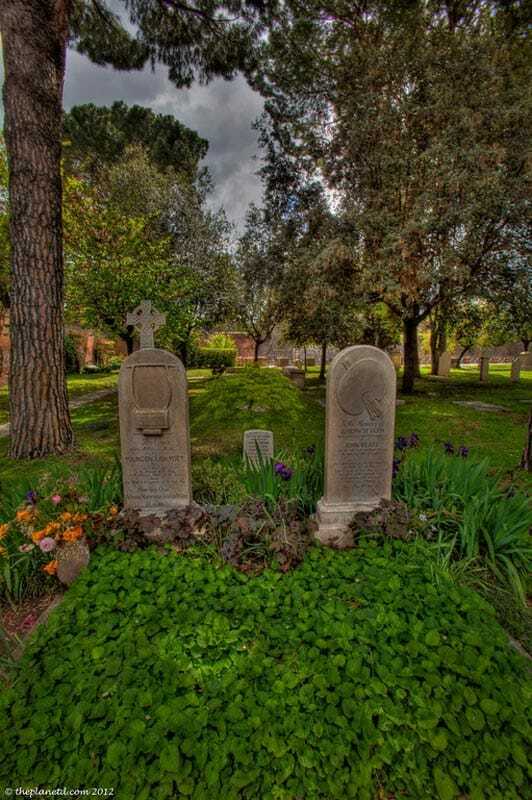 19 Responses to "Protestant Cemetery in Rome – A Non-Catholic Cemetery for Foreigners"
Interesting stuff! I admit to never having heard of this cemetery, either. 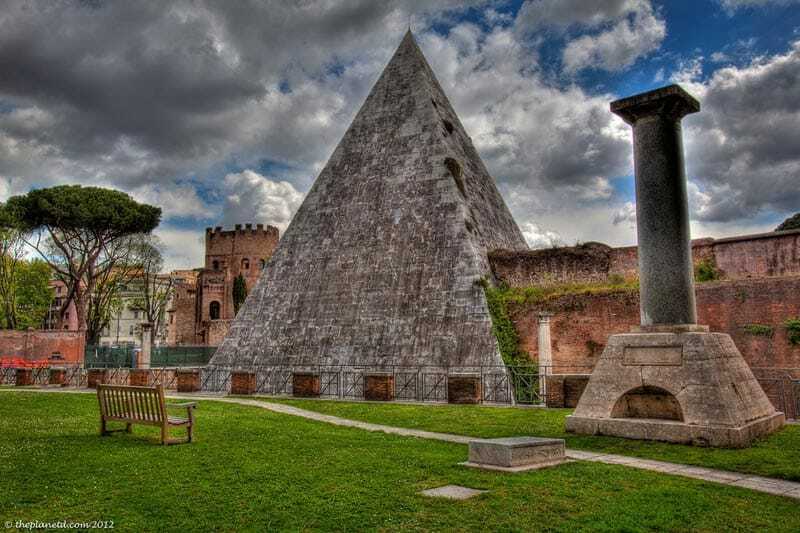 I did see the pyramid when I was in Rome, but I had no idea it was an intended tomb! Really interesting piece and what an amazing sight! 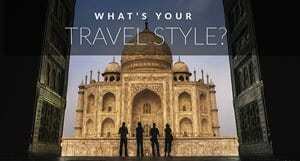 I’m now going to search your site to see if you have any photos of La Recoleta Cemetery in BA! Hey Holly, We don’t unfortunately. We haven’t been to Buenos Aires yet. But it’s high on the list, and I can assure you’ll we’ll make it to the cemetery for sure. We sort of like visiting these places. I love the tomb from 12bc. Absolutely beautfiul and interesting that he’s not even buried there. It is quite the story isn’t it. Amazing that something this old is standing in an out of the way spot in the city. That is Rome for you, full of surprises. The shots are just incredible. Great post guys. LOVE Kenny! Such a great guy and a fun tour. 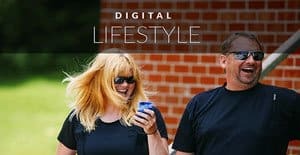 Nicely paced, great info, fabulous food. So glad you got to go! D&D your shots are sooo captivating. I’ve walked through the famous Pere Lachaise grounds in Paris, equally beautiful but certainly a contrast. Thanks for sharing this intriguing spot! Looking forward to visit this place someday..All the views are really beautiful..Thank you for sharing..
Wow, what an incredible discovery! I would love to visit one day. Great HDR pics!!! Great find. Genius is rarely appreciated until their time has passed. Cheers to Keats! Amazing that there are so many english graves in an italian cemetery. Beautiful photos as well. 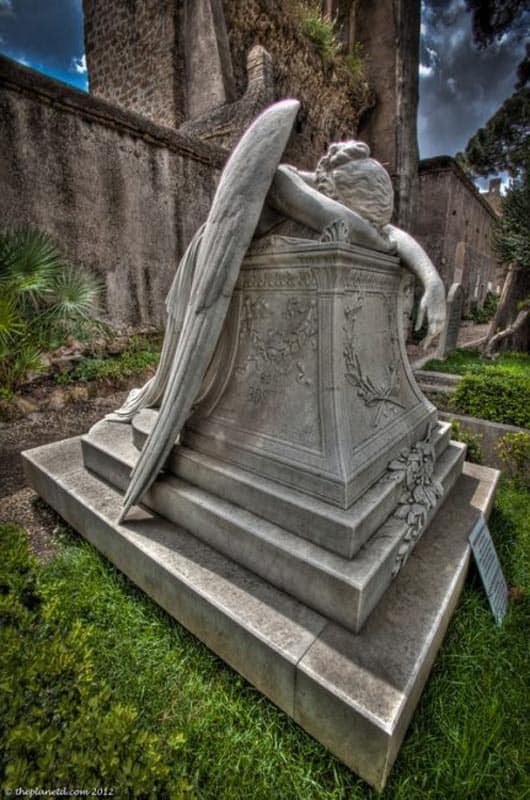 I had heard of this cemetery before but I never made it there while I was in Rome as I spent all of my time at the more popular sights. I can’t wait until my next visit to spend time visiting the less popular spots.